Joe Gomez has hailed Mohamed Salah as "relentless" after he scored his 50th Liverpool goal in just 65 appearances. Salah brushed off criticism of his form this season by scoring twice in a 4-0 Champions League demolition of Red Star Belgrade on Tuesday. Reds boss Jurgen Klopp insisted he has not had any doubts over the Egypt international and defender Gomez believes Salah is "special". 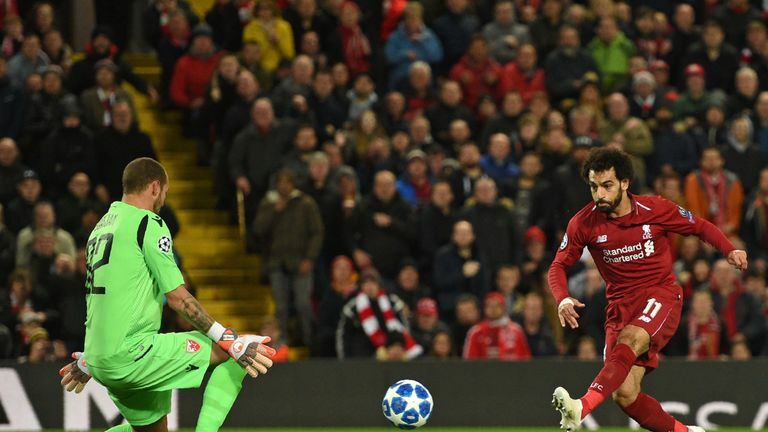 Jurgen Klopp discusses Mohamed Salah's goals after Liverpool beat Red Star Belgrade. "Fifty goals is unbelievable. I'm trying to get my first one," he told Liverpool's media channel. "It's special, Mo's a special player. "It just showed that he carries on, he's relentless with his pursuit for goals, and that's what makes him a top player, and hopefully he continues. "It's always nice to get a solid result with some good goals and a clean sheet obviously as well. It was important that we got some more points on the board for the group and we've just got to continue it now and keep making steps. Clean sheets are important, and it was nice to get another one. Jurgen Klopp insists he has never had any doubts about Mo Salah's form this season. "We knew at times we'd have a lot of possession and would have to try to break them down. It's about being patient at the same time, not getting bored of passing and [the manager] made sure that he emphasised that to us." Liverpool top Champions League Group C with two wins from their three matches so far, including victory over Paris Saint-Germain but defeat at Napoli. They travel to Belgrade next before another away trip to Paris at the end of November and then a final group clash with Napoli at Anfield on December 11.